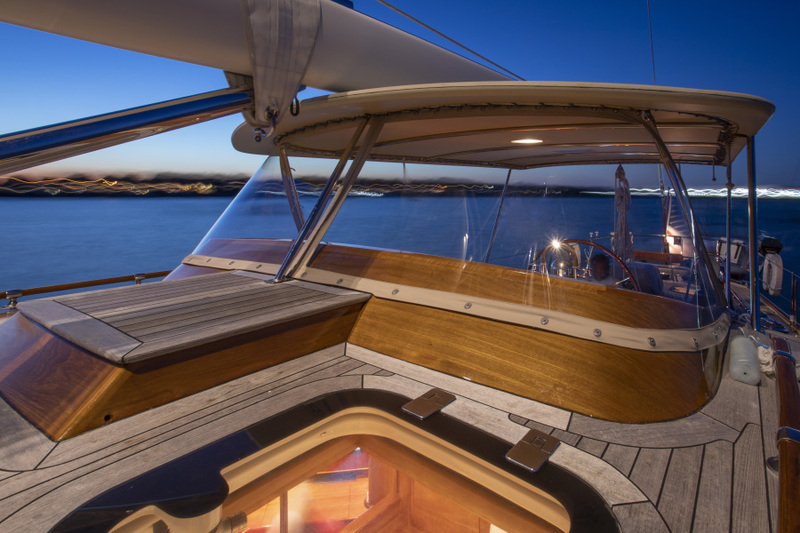 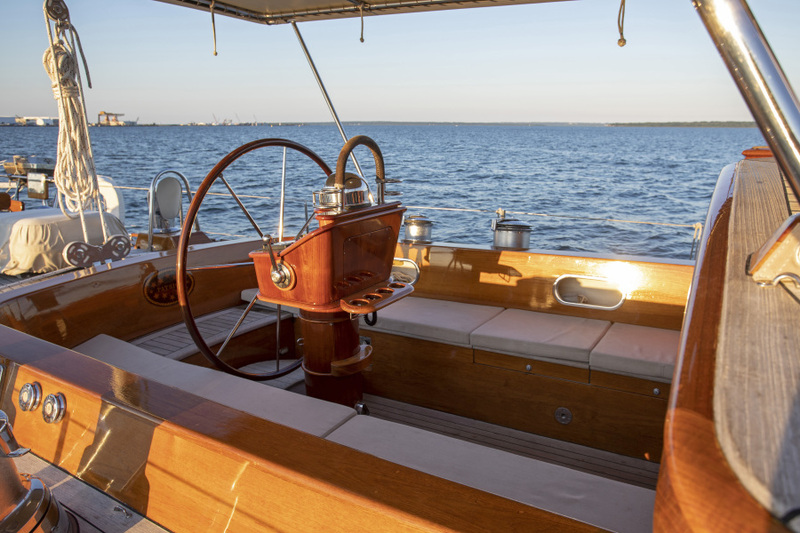 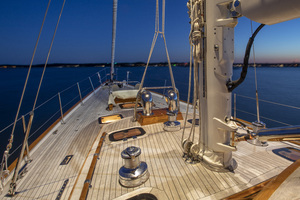 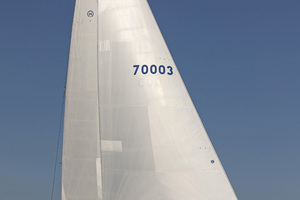 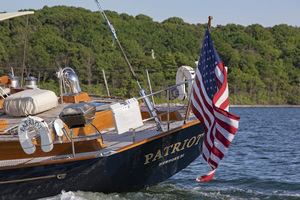 The Hinckley Sou’Wester 70 is the Queen of the Hinckley fleet and without question, PATRIOT is the best of her breed. Built to the highest possible specification of her day, beginning with an infused, cored composite hull and deck with variable density foam core for optimal strength and adhesion, her three-stateroom plus crew interior is furniture quality throughout, her pilothouse offers sumptuous comfort and 360 degree visibility and her sail handling has been engineered to offer thoroughbred performance with minimal crew. 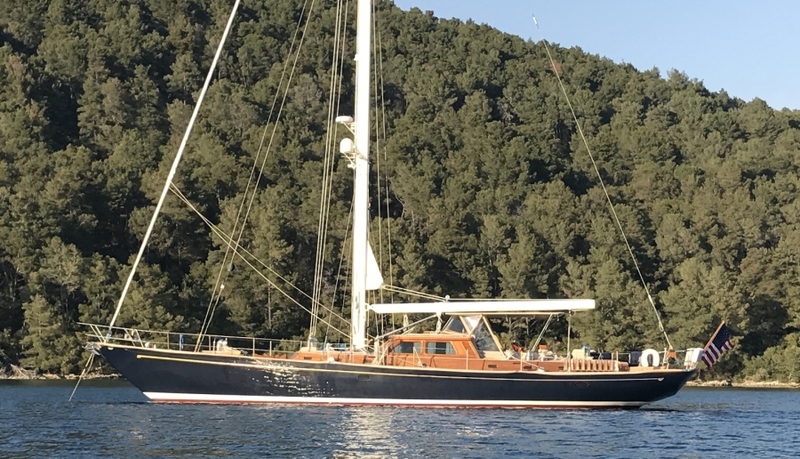 Indeed, PATRIOT is a yacht that lives like a palace and sails like a dream.She has been cruised extensively on both sides of the Atlantic and always maintained with an eye to preventative maintenance. PATRIOT is in turn-key condition, ready to cruise all oceans. 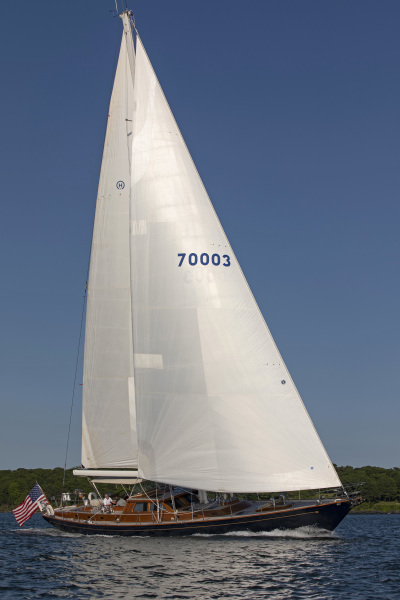 United Yacht Sales New Jersey would love to guide you through a personal showing of this 70' Hinckley Sloop 2002. 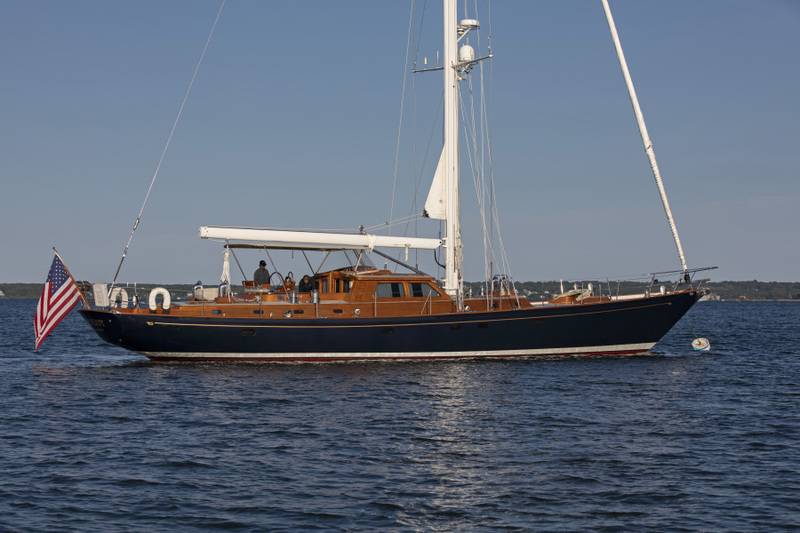 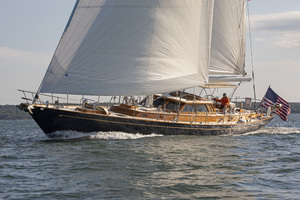 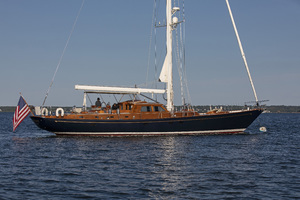 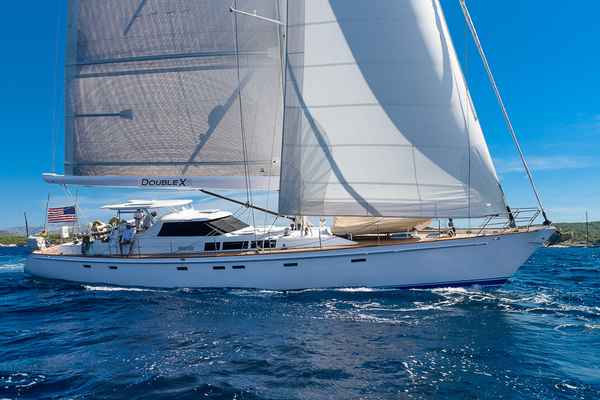 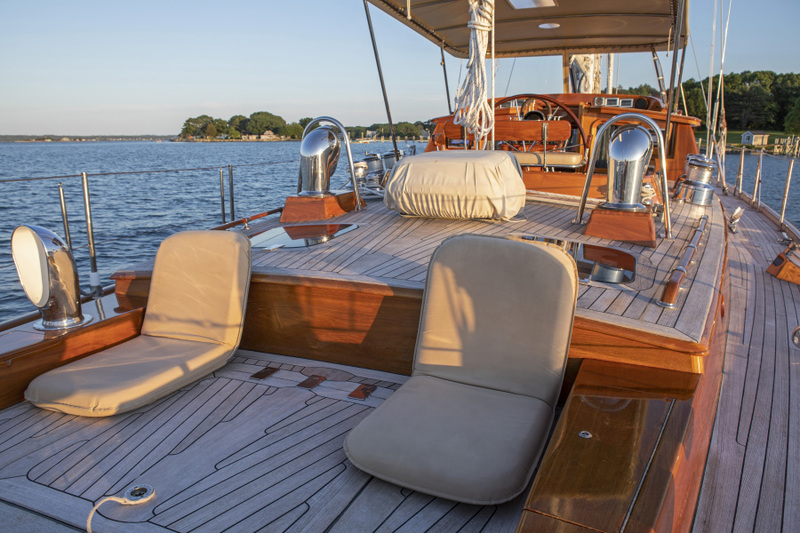 This yacht for sale is located in Newport, Rhode Island and priced at $1,750,000. For a showing please contact us by filling out the form on this page and we will get back to you shortly! The Hinckley Sou’Wester 70 is the Queen of the Hinckley fleet and without question, PATRIOT is the best of her breed. 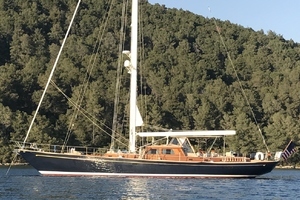 Built to the highest possible specification of her day, beginning with an infused, cored composite hull and deck with variable density foam core for optimal strength and adhesion, her three stateroom plus crew interior is furniture quality throughout, her pilothouse offers sumptuous comfort and 360 degree visibility and her sail handling has been engineered to offer thoroughbred performance with minimal crew. 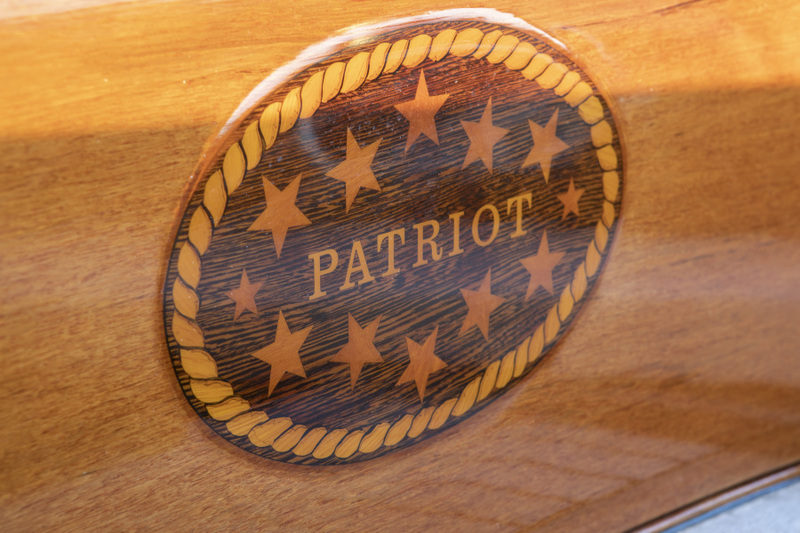 Indeed, PATRIOT is a yacht that lives like a palace and sails like a dream. PATRIOT’s on deck arrangement is practical in all respects and elegantly detailed in natural and varnished teak. 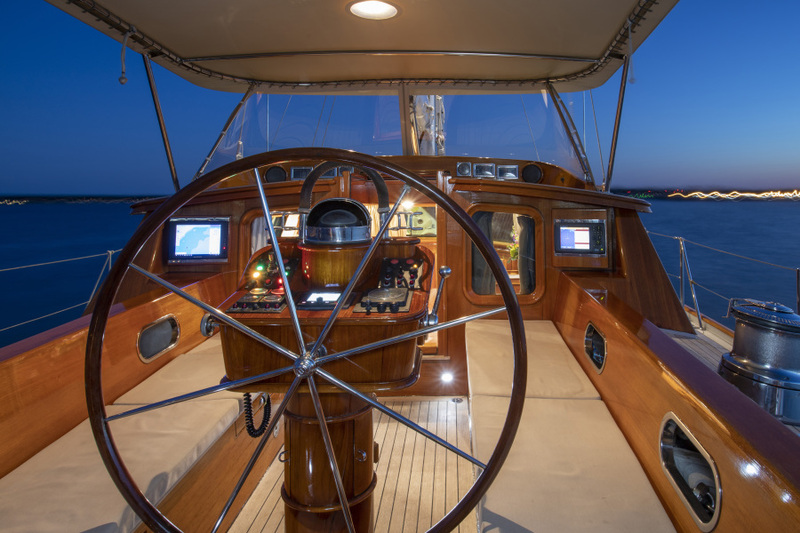 Her center cockpit is comfortable for entertaining and dining around the bright varnished teak table, while offering convenient access to all sail handling controls and equipment.The cockpit is fully protected from the elements with a combination Dodger/Bimini, framed in SS and covered with Linen Sunbrella, with clear Stratoglass windows forward and removable Stratoglass panels forward port and starboard.Additional clear side curtains create a complete and comfortable enclosure. 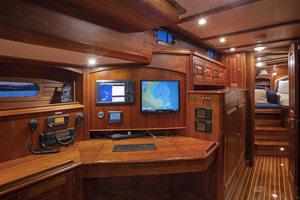 Indeed, PATRIOT’s helm and entertaining cockpit easily adapts to all environments.Cockpit equipment includes:SS & Sunbrella Dodger/Bimini w/windows & removable side curtains(2) Awnings by Antigua Sails headstay to mast and mast to backstaySS & Teak helm with ebony inlayCustom varnished teak table seats 6­8 guestsCustom refrigerator, drawer style with Sea Frost cold plate refrigerationCockpit lighting w/dimmersCockpit cushionsOpening port to navigation stationControl panel w/tachometer, alarms, start/stop and remote screenSecondary panel with VHF, autopilot control, B&G controls, Fireboy remote, fog horn & alarm lightsNauti­Comp 18” computer screen for navigation (2018)Furuno remote radar displayB & G Instruments at companionwayThe aft deck has access to the large lazarette and tri­fold passerelle, with man­overboard and safety gear stowed on the stern pulpit.Side decks are clear and uncluttered, as is the foredeck, with removable staysail stay, double bow roller and windlass, and custom bow seat in the forward pulpit. 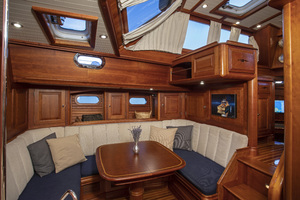 The low profile raised pilothouse aboard PATRIOT is directly forward of the cockpit, three steps down, with a retractable window that helps to create a contiguous entertaining area. 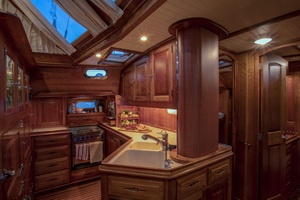 In addition, there are three opening hatches in the pilothouse and large grey tint windows all around which in sum, create an abundance of natural light, ventilation and unrestricted visibility.Outboard to port is a large U­shaped dinette with custom table with ‘PATRIOT’ inlay in the varnished cherry, complimented by a border of inlaid, carved roping. To starboard is a full wet bar area with inlaid Deer Isle granite countertop, retractable TV and complete audio entertainment equipment. 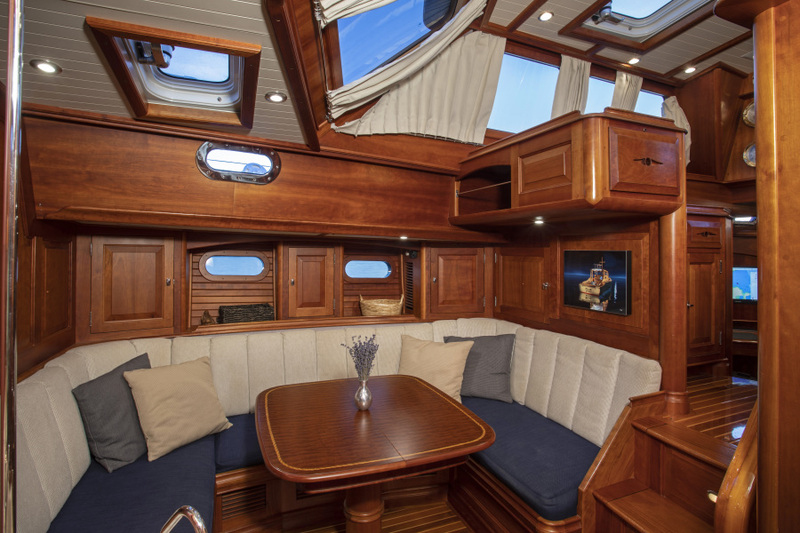 The forward pilothouse windows extend well beyond the four steps down to the Main Salon to starboard and the Galley to port, which creates a perception of spaciousness seldom present aboard a 70’ yacht. 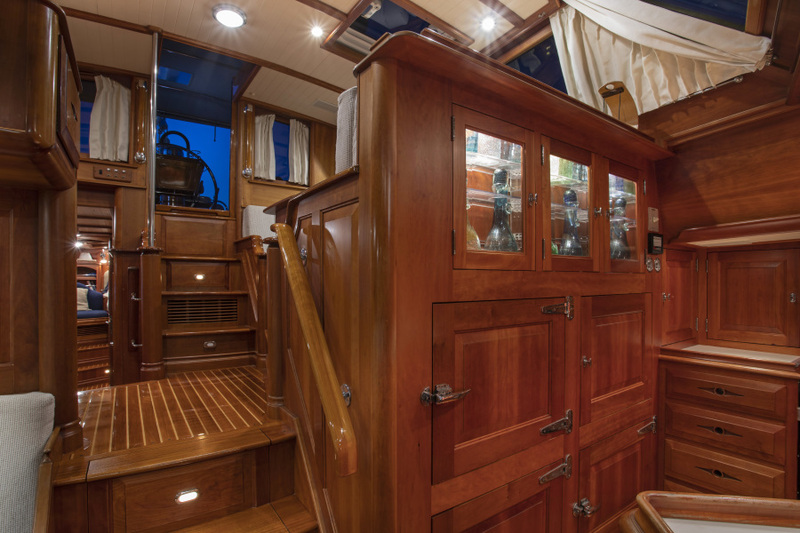 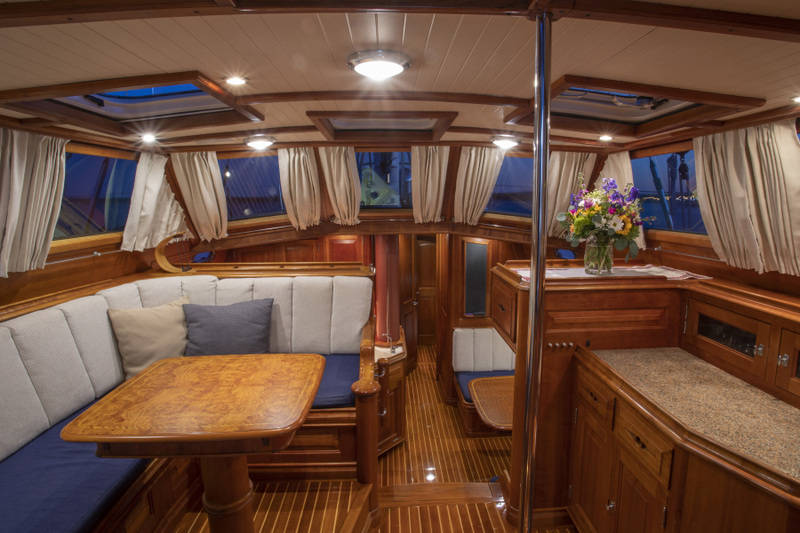 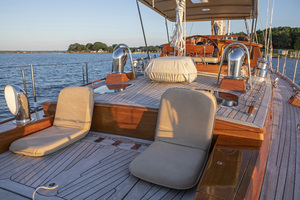 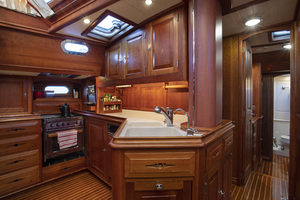 The salon is centered on a U­shaped custom pedestal Sapele Mahogany table and lounge area to starboard, with a hull port outboard between additional lockers and bookcases. 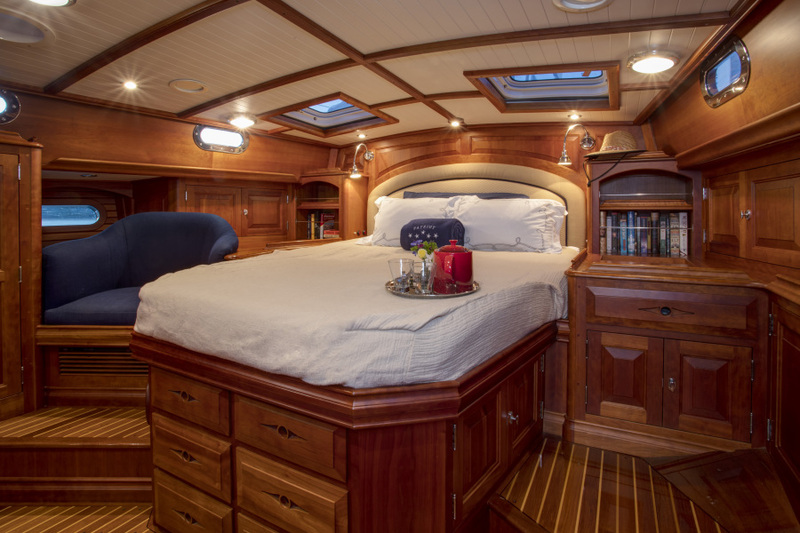 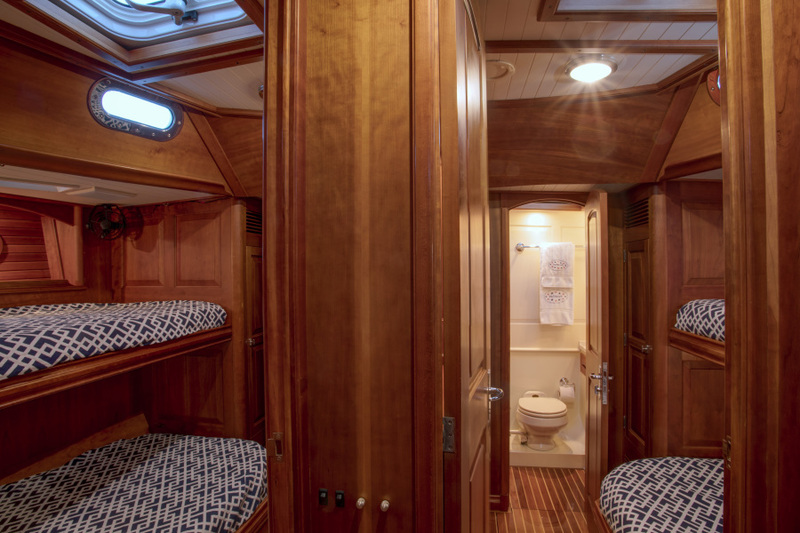 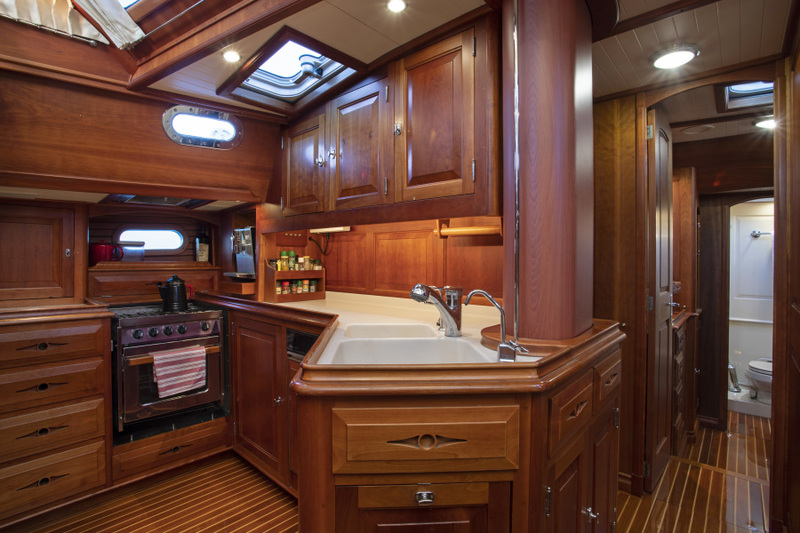 Forward of the galley and salon, there are Two Guest Staterooms, port and starboard, each with Tempurpedic foam mattresses, portlight and opening overhead hatch, mirror & vanity, hanging locker and additional drawer and locker stowage. Both staterooms have a full size lower berth outboard with a Pullman berth above that folds down to create a settee.Both cabins have a private ensuite head with Vacu­Flush WC, vanity and sink and cabinet stowage. 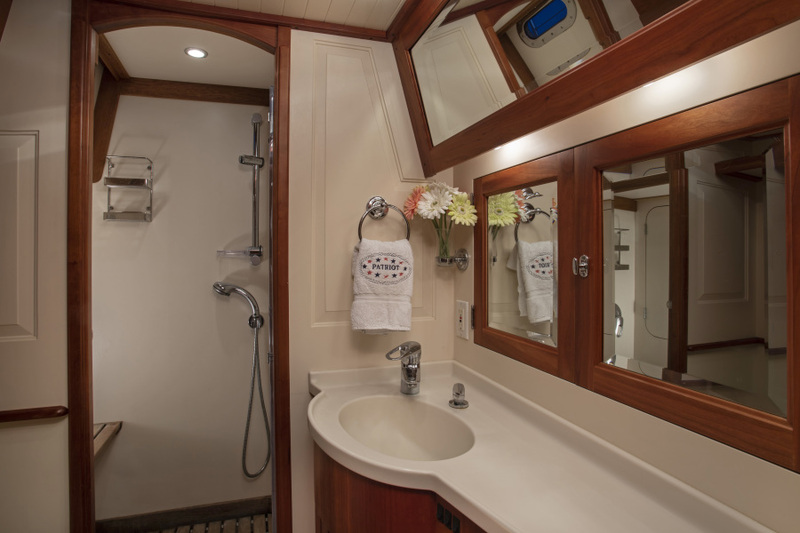 The private heads adjoin a shared, centerline stall shower area with Grohe fixtures & soap dispensers, Cantalupi fixtures, towel bars, exhaust fans, etc.. 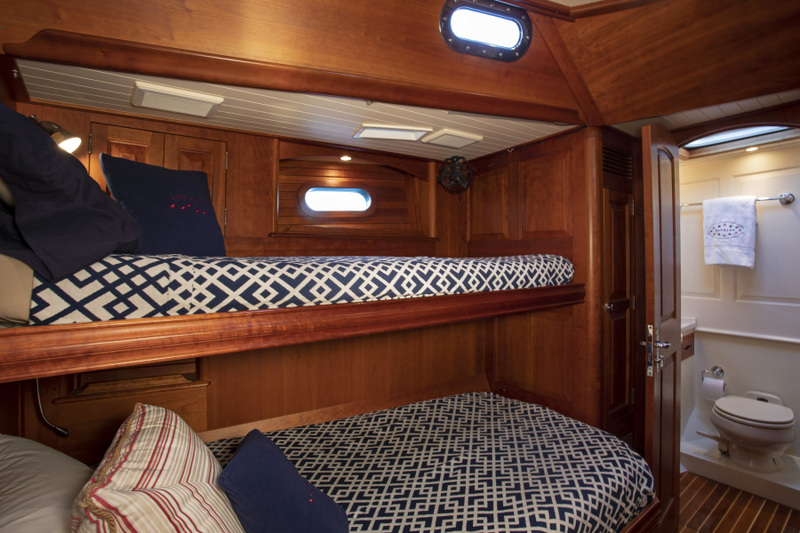 Fully forward, the Crew Quarters have over and under single berths to starboard, with the upper berth folding down to create a settee. 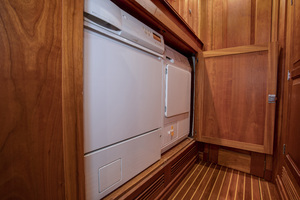 To port are two hanging lockers and additional stowage. 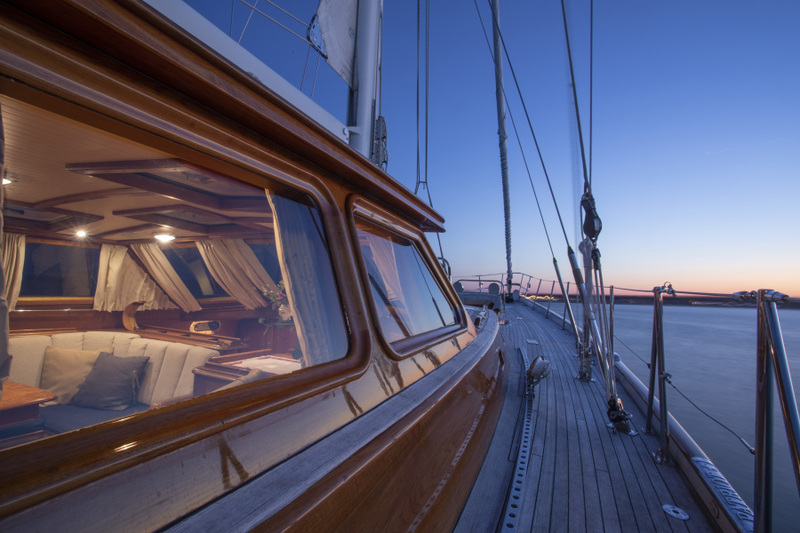 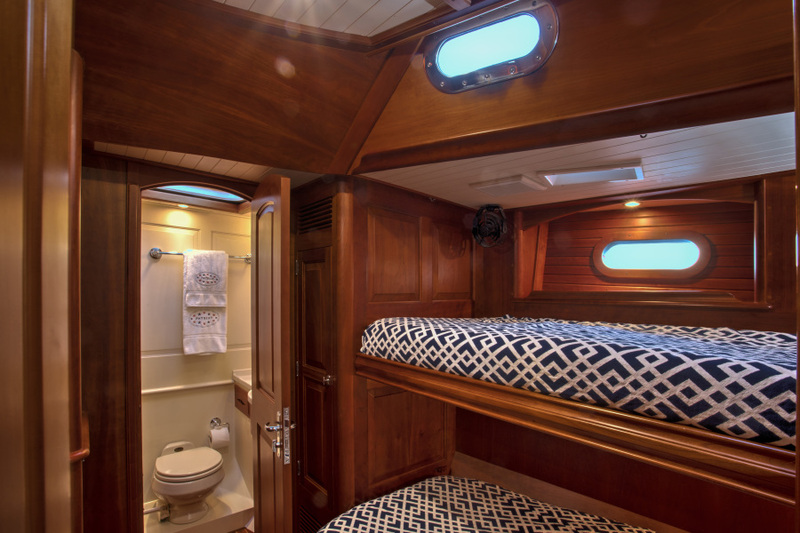 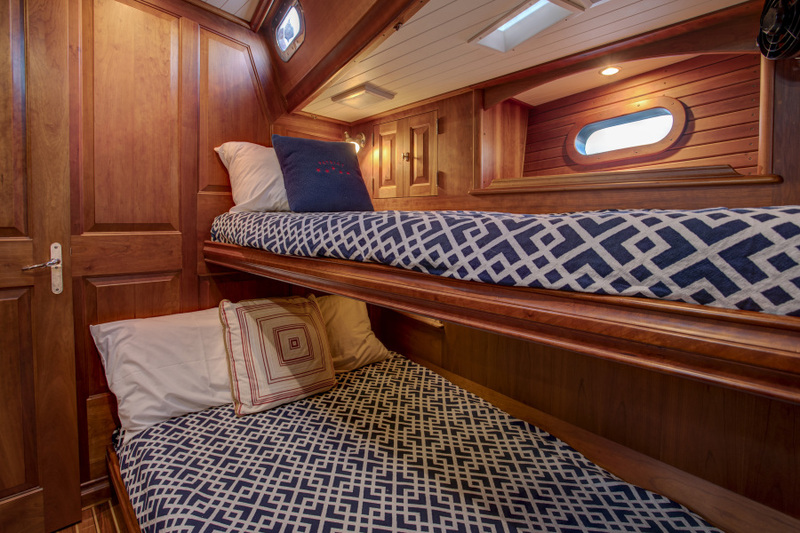 The crew companionway to the foredeck has a custom dodger and there is also access via either of the gueststaterooms. Forward to port of the crew cabin is head with stall shower, Vacu­flush head, sink, vanity, opening port and exhaust fan. BROKER’S COMMENTS;PATRIOT has been cruised extensively on both sides of the Atlantic and always maintained with an eye to preventative maintenance. She is in turn­key condition, ready to cruise all oceans.